Own Andy's Safari Adventures - Hermit Crabs & Other Adventures DVD from Deff, DVD, Blu-Ray & 4K Video Specialists - Free UK Delivery..
Own Andy's Safari Adventures - Lions Giraffes & Other Adventures - Volume 1 DVD from Deff, DVD, Blu-Ray & 4K Video Specialists - Free UK Delivery..
Own Andys Baby Animals - First Steps And Other Stories DVD from Deff, DVD, Blu-Ray & 4K Video Specialists - Free UK Delivery..
Own Andys Baby Animals - Playtime And Other Stories DVD from Deff, DVD, Blu-Ray & 4K Video Specialists - Free UK Delivery..
Own Andys Dinosaur Adventures - Diplodocus And Dung DVD from Deff, DVD, Blu-Ray & 4K Video Specialists - Free UK Delivery..
Go on a prehistoric adventure searching for the dinosaurs that once roamed the planet. Andy works at a museum. He loves his job, and he loves dinosaurs – but his clumsiness often threatens the 'grand opening' of the latest exhibits, so Andy must travel back in time to come face to face with real dinosaurs and make sure that the exhibitions can open on time! Iguanodon Footprint: Andy travels back in time 127 million years, to the time of..
Own Andys Dinosaur Adventures - T Rex And Pumice & Other Stories DVD from Deff, DVD, Blu-Ray & 4K Video Specialists - Free UK Delivery..
Join Andy and his friends on a prehistoric adventure searching for the dinosaurs that once roamed the planet. Andy loves his job at the Museum, and he loves dinosaurs - but his clumsiness often threatens the grand opening of the latest exhibit. In a race against the clock, Andy must travel millions of years back in time and come face to face with real dinosaurs to save the exhibition! 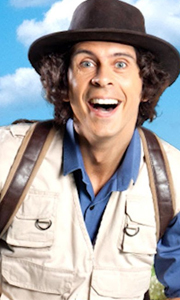 Pre-history is brought to life in Andy's Dinosaur Ad..
Own Andys Prehistoric Adventures - Gigantoraptor & Feather DVD from Deff, DVD, Blu-Ray & 4K Video Specialists - Free UK Delivery..
Travel back in time with popular CBeebies presenter, Andy Day, as his latest spectacular adventures brings natural history and science to life for young viewers. Heading back to a prehistoric world he comes face to face with the dinosaurs that once ruled our planet and the ice age beasts that followed in their footsteps. But he's not just taking to the land - Andy's underwater adventures takes him back 36 million years in search of the ..
Own Andys Prehistoric Adventures - Woolly Mammoth and Tusk DVD from Deff, DVD, Blu-Ray & 4K Video Specialists - Free UK Delivery..
Own Andys Prehistoric Adventures Series 1 DVD from Deff, DVD, Blu-Ray & 4K Video Specialists - Free UK Delivery..
Own Andys Wild Adventures - Bumper Pack - Volume 1 DVD from Deff, DVD, Blu-Ray & 4K Video Specialists - Free UK Delivery..
Own Andys Wild Adventures - Bumper Pack - Volume 2 DVD from Deff, DVD, Blu-Ray & 4K Video Specialists - Free UK Delivery..
Own Andys Wild Adventures - Emperor Penguins Meerkats And Other Stories DVD from Deff, DVD, Blu-Ray & 4K Video Specialists - Free UK Delivery..
Own Andys Wild Adventures - Grizzly Bears, Flamingos And Other Stories DVD from Deff, DVD, Blu-Ray & 4K Video Specialists - Free UK Delivery..
Own Andys Wild Adventures - Hippos Cheetahs And Other Stories DVD from Deff, DVD, Blu-Ray & 4K Video Specialists - Free UK Delivery..
Own Andys Wild Adventures - Lemurs Polar Bears And Other Stories DVD from Deff, DVD, Blu-Ray & 4K Video Specialists - Free UK Delivery..
Own Andys Wild Adventures - New Zealand Penguins Ostriches And Other Stories DVD from Deff, DVD, Blu-Ray & 4K Video Specialists - Free UK Delivery..
Own Andys Wild Adventures - Orangutans, Chimpanzees And Other stories DVD from Deff, DVD, Blu-Ray & 4K Video Specialists - Free UK Delivery..
Own Andys Wild Adventures Series 1 DVD from Deff, DVD, Blu-Ray & 4K Video Specialists - Free UK Delivery..